Java Cards are the next step in Smart Card technology. Basically, a Java Card is a smart card that can be programmed in a high level language instead of assembly language. This naturally makes producing application software much easier. The choice of Java has other advantages: portability, its popularity in the computing community and its design around applets -- small code objects designed to be downloaded onto a client machine from a remote host -- perfect for smart cards! 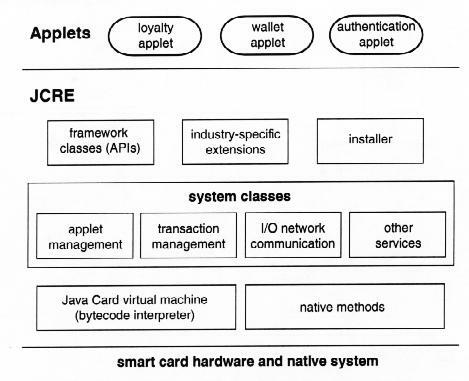 A year after the first Java Card specification was released in November 1996, every major vendor of smart cards in the world had licensed the technology. Both Schlumberger and GemPlus, companies that combined sell something like 75 percent of all smart cards, already have implementations and development toolkits for sale. By 2001, over 700 million of the 3 billion cards sold will be Java Cards. Java Card Virtual Machine (JVM). This defines a logical machine that programmers can easily deal with. Java Card Runtime Environment (JCRE). This is essentially the card's operating system. 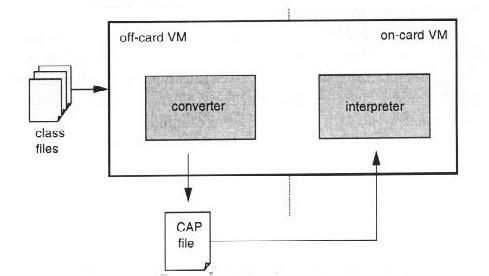 The Java Card Virtual Machine is split into two parts: a converter that runs off-card and an interpreter that runs on-card. produces an executable binary CAP file that can run on the interpreter, and an export file. CAP stands for 'converted applet' and is a new type of file format specially designed for Java Cards. It is loaded onto the card. The export file however, is not. Export files can be thought of as the header files in C; they contain public API information for an entire package of classes. They are used by the converted itself for verification and linking purposes, and can also be distributed by applet developers to users (since they contain no implementation details). The CAP file is loaded onto the card via a pair of installers on and off the chip. The on-chip installer writes it into the smart card memory, links it with the other classes that have already been placed on the card, and creates and initializes any data structures that are used internally by the Java Card runtime environment. The division of functionality between the interpreter and the CAP file installer keeps the interpreter small and provides flexibility for installer implementations. The installer and the interpreter are not the only system components running on the Java Card. There are others, and together they form the JCRE. The JVCM handles memory allocation, bytecode execution, object management and security. The native methods handle low-level communication protocols, memory management, cryptographic support and more. The System classes handle the tasks that an operating system core normally would, and invoke the native methods to do this. The API classes are compact 'libraries' that make it easier to create applets. The installer loads applets onto cards. Other extensions are industry-specific libraries; for example the Open Platform extends the JCRE services to meet banks' special security needs. The JCRE is loaded onto the Java Card at the factory and remains there till the card is destroyed. When the card is placed in a Card Accepting Device (CAD), it is activated and begins copying data/programs from EEPROM and ROM to the faster RAM. During transactions, data and objects that must be preserved are copied from RAM into EEPROM. Recall that EEPROM preserves data in the absence of power. When power is lost, the card goes into hibernation. Advancel Logic Corporation developed the Tiny2J Microprocessor Core for Java cards and SmartCards in 1998. The same year, Advancel licensed the Tiny2J architecture to STMicroelectronics who combined it with its own secure architecture and advanced EEPROM technology and ended up winning the prestigious `SmartCard Technology - Best new chip 2000' award with its SmartJ chip.